There’s something kinda intimidating about Senator boats. They look like they mean business. It might be that big, bulbous-looking bow, or the way that the hulking solid construction gives the impression that it could stand up to anything. They are beefy boats and they are built to handle serious weather. Park one up against one of its lesser competitors and it could look like a bit of a bully, actually. Big isn’t always beautiful though. The Typhoon MH630 could never be described as elegant. That would be like describing an All Black prop as elegant. No, it’s certainly no show pony but chiselled good looks? Yes, definitely. This boat is a handsome brute. A big handsome brute. And it has plenty other attributes to make it a serious competitor when vying for your hard-earned buck. 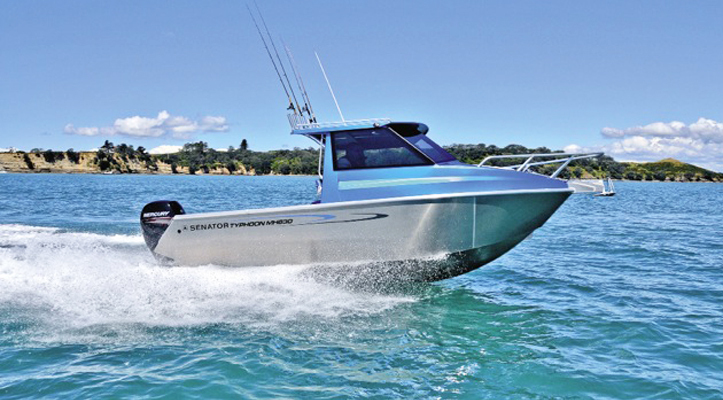 NZ Fishing World was lucky enough to get its hands on a test model thanks to the good guys at Auckland Marine Centre.